A black spider with white dots just went scuttling past you in the garden and you wonder if you should be worried. Most of the black spiders with white spots you'll find are a type of jumping spider and are not dangerous to humans. Some other spiders with a similar appearance, such as an immature black widow, can be quite dangerous, however. 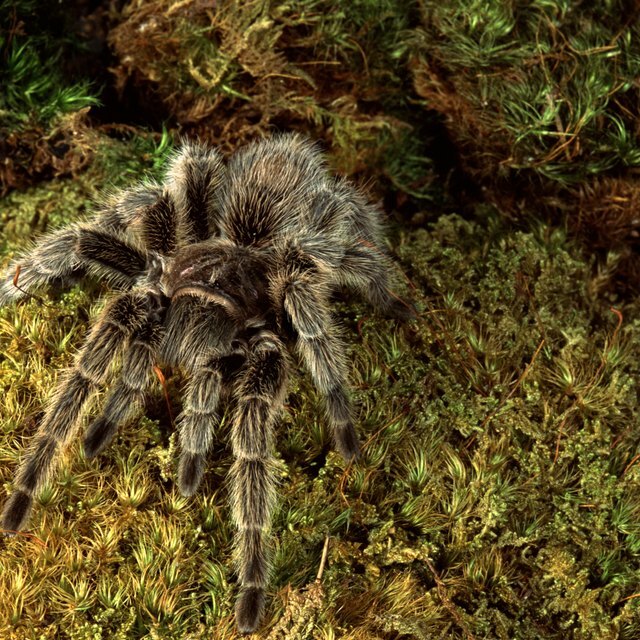 Of the 3,000 species of spiders in North America only a few types are dangerous to humans. Many other harmless spiders have black bodies with white spots, so it's helpful to know how to tell the difference. Black spiders with white spots are often jumping spiders. Although the name sounds scary, these spiders aren't dangerous to humans. The jumping spider gets its name because it stalks or waits for its prey and then leaps out to catch the meal. A jumping spider has a fuzzy appearance. The black body has different markings depending on the species, but often has bands of white on the legs and a few white markings on the back. Jumping spiders are small with short, stocky legs. The white-backed garden spider does indeed have white markings on its dark back. The markings can range from white to cream to yellow and the body is a muted black, rather than the deep black of a black widow. The legs have bands of black and white or yellow and the abdomen has a oval or leaf shape. These spiders are excellent for pest control in your garden. When you see these spiders, you may not even know you're looking at a spider. These spiders have odd-shaped abdomens with spiny protrusions giving the spider a crab-like appearance. Some of these spiders have black abdomens with white markings, or vice versa, and others have red markings. These interesting spiders are not harmful to humans. We often think of the black widow as having a red hourglass shape on her body, but the male and immature black widow can have white spots. The markings run along the spider's sides and back. The bite of either male or female is dangerous. One key feature you can use in identifying the black widow are well-defined markings on a large abdomen. Wolf spiders are similar to jumping spiders in that they have fuzzy dark bodies and some have white markings. However, most species' color patterns are shades of gray rather than stark black and white. Wolf spiders tend to be medium-sized spiders, with a body measuring up to an inch, not including the legs. Wolf spiders will bite people and the bite needs to be tended to by a doctor, but the venom is not fatal. Painter, Tammie. "Types of Spiders: Black With White Dots." Sciencing, https://sciencing.com/types-spiders-black-white-dots-8206221.html. 13 March 2018.